And with that i raise a toast with a Nola style Poinsettia Cocktail with Old New Orleans Cajun Spiced Rum! Who said you can`t mix dark rum and champagne? Pour the rum, grenadine and cranberry juice into a mixing glass and stir, then donate to the champagne coup. Garnish with a speared piece of Poinsettia “flower” (it´s a leaf really) it´s not edible. Now, that´s a refreshing little New Year drink! Here´s a little drink i´ve been curious about for a while but never had the time to try out until now when it´s time to get back to normal work after the Tales is over for this time. The Yellow Boxer i found in Remixed by Jeff Berry – but who made it? where is it coming from? what inspired it or made it happen? – well… i have no idea. Browsing through the interwebz for research didn´t lead me to any much info, just recipes but no info on it´s history. In any case fresh lemon juice, tequila, galliano, lime and orange must be tasty right? and also this is such a drink that you can play with and have some fun. So what do you do with a drink which you cannot find any info about apart from the recipe? well, you mix it up… it better taste good since it`s just the drink i can come up with in this post.. Shake with a scoop of crushed ice and strain into a tall glass filled with fresh crushed ice. It was a while since i did something with tequila, it´s mostly rum being poured here…With tequila and many other spirits i´m more like a periodic user, i don´t know why it´s that way but i guess it´s just the way i roll. Anyway, back to the drink, how did it taste? Hm…it was good…refreshing…and nice…but not WOW – and so i was dying to make a twist of it. Some drinks just calls for that and it´s something i really enjoy doing. Now i wanted something spicy, paired with something fruity, tart and sweet and then something dark..mellowed by something soft.. So i decided to use two rums i like very much, unfortunately one of them is impossible to find outside of the States or maybe even New Orleans, it´s the ONO Cajun Spiced rum i`m talking about. The other rum is Coruba dark, a very handy and versatile rum i always want on my shelf, i`m sure many of you readers agree on that. I don´t know how to sub the ONO Cajun Spice though..but maybe a lightly cayenne and cinnamon, nutmeg, ginger and clove infused dark Jamaican rum would add a similar spice but it wouldn´t be the same thing of course. It`s a pity this rum isn´t sold worldwide, it´s such a good rum and i`m sure it would sell well too, i haven´t yet met anyone who have tried it and not really liked it. It`s this kinda rum that once you try it you`ll keep coming back for more. Shake with a scoop of crushed ice and pour unstrained into a double old fashioned glass and add up with more fresh crushed ice. 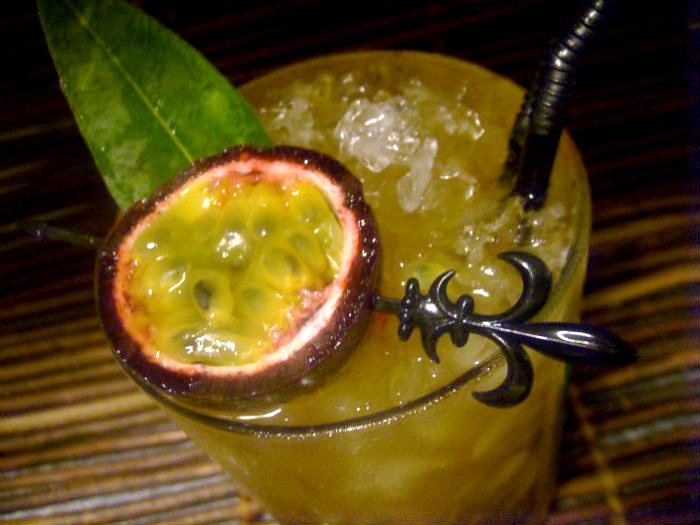 Float ONO Cajun Spiced rum and garnsih with a speared half passionfruit shell and either mint or other green leaf. Well this was a very tasty drink! 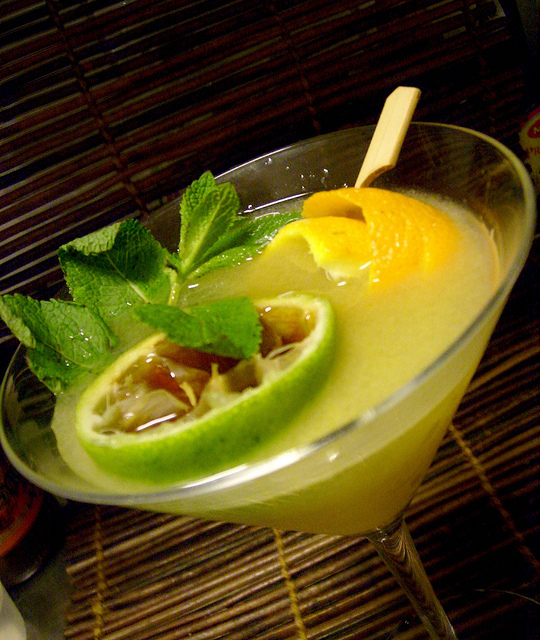 it`s fruity, sweet and sour, tart, spicy, rummy and layered. I think i`m lucky today! I hope you can try it out with the ingredients listed, if not, try to get as close as you can. Also this is a drink that allows much experimentation, i bet this would be nice with a float of mezcal as well or aged rhum agricole. So there i got my passionfruit and vanilla drink which i wanted to invent ever since i went to that vanilla session at Tales. Browsing through Remixed i always stops at the picture of Garrett`s Maitini – it looks so deliscious! i have of course since long been thinking of making it but never got that far until now. I need to switch out the rum though since i don´t have Bacardi 8. As you can see from the name this drink is based upon the Mai Tai but uses orange and kalamansi juices. Kalamansi is a citrus fruit from the Phillippines and south east China (Citrus microcarpa) also called kalamondin, which is is a cross between Citrus reticulata (Mandarin orange group) and Fortunella japonica (Kumquat group) and it really has a taste of its own which is a combination of sweet and sour, like a cross between lime and tangerine. That is due to the fruit meat is sour while the peel is sweet so when making the juice the whole fruit is crushed. I can`t get the fresh ones here, only bottled and because of that i decided to mix the bottled juice with some fresh lime juice to pimp up the freshness. Kalamansi has such a unique flavor that is cannot be substituted and if you cannot find it, the only thing left is to use fresh lime, preferably key limes. I laugh at the name “MaiTini” though..the “tini” part that is…but drink names can really be silly. Anyway there´s nothing silly about the drink itself. Since i didn´t have any Bacardi 8 i decided to try the combo of 1.5 oz Smith & Cross ( my no 1 to-go rum nowadays unless it´s a demerara i need) and 0.5 oz Old New Orleans Cajun Spice plus 0.25 oz overproof Pusser´s. Shake ingredients with ice cubes and strain into a chilled cocktail glass. Garnish with an orange peel and three of your spent kalamansi lime shells filled with dark jamaican rum. If using an ordinary lime, one spent half shell is enough, the glass gets crowded anyway. i like this drink, especially now when the summer is on the way. Its a bit on the sour side and very fruitylisciously tasty! exotic, fruity and most important – rummy. So what to do now for a twist of this? well i took my bottle of Abelha gold aged cachaca to mix with the Smith & Cross and ONO Cajun Spice, grapefruit juice instead of orange and 4 muddled Louisiana community coffee beans. 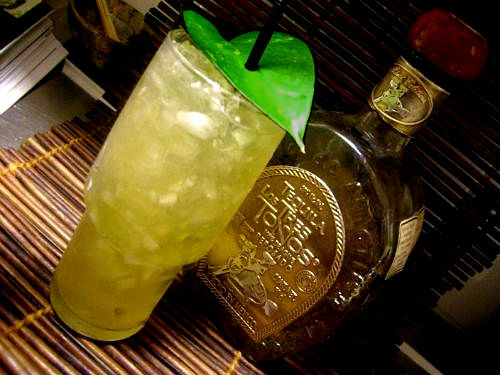 We´re far away from the Mai Tai now..very far so it´s a new drink, not even a Mai Tai twist anymore. Muddle coffee beans with orgeat and fresh lime. Add rums, aged cachaca, kalamansi and grapefruit juices. Shake hard with ice cubes. Double strain into a chilled cocktail glass. Garnish with fresh mint and speared cherry. Float a spent lime shell on top of the drink, fill with overproof rum and set alight. Oh my…this is a nice drink! the very fine and yet robust flavor from the muddled coffee beans from one of the best coffees in the world is exquisite. Since i first tried Community coffee from New Orleans i never drink anything else (except sometimes – either Jamaican Blue Mountain or Hawaiian Kona coffee), nothing else will do. But if you cannot find Community, Kona or Blue Mountain coffee, make sure to use strongly roasted beans. I greatly prefer the natural and not overpowering flavor from real coffee beans rather than a coffee liqueur, it really makes a difference. Together with the grapefruit juice there´s a contrasst that i like a lot and the fresh lime and kalamansi adds that extra zing to it. 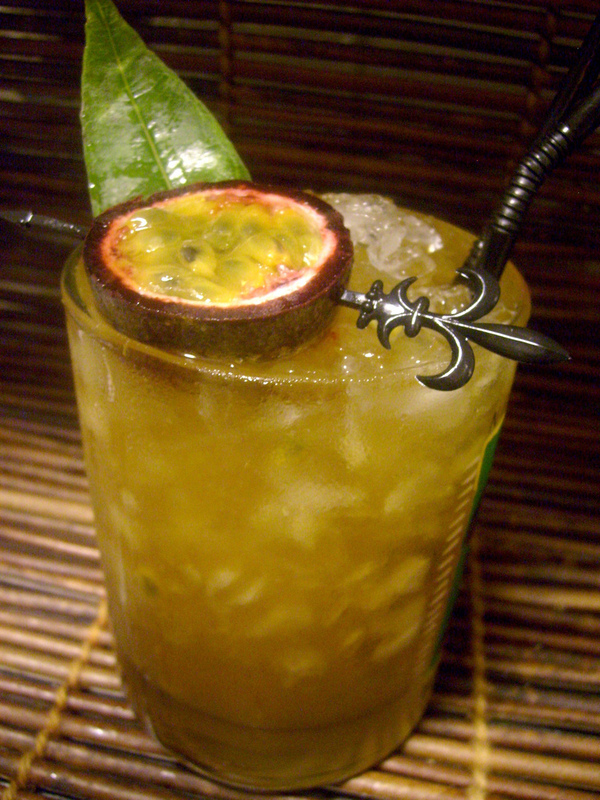 Then the blend of rums..it´s simply deliscious. 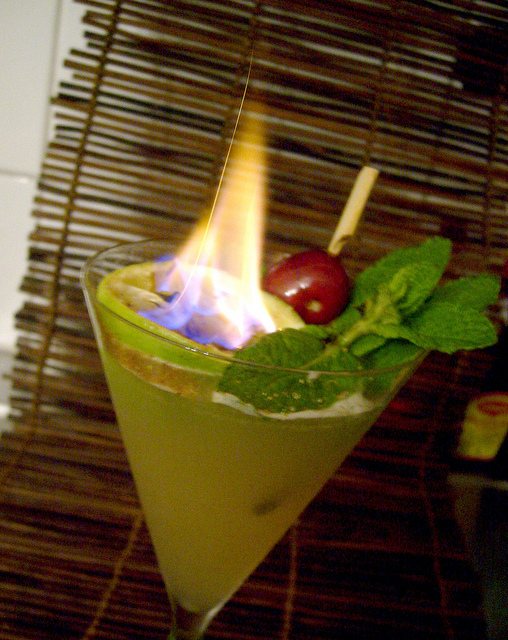 You don´t need to set a lime shell on fire to appreciate this drink, that´s more for the fun of it – it´s fun to sprinkle some cinnamon over the flame to get it going and i have to admit that the burnt demerara adds a slightly smoky touch too.. I guess this is one of my better drinks..what a luck! It took me to go all the way to New Orleans to be able to lay my hands on one of the Old New Orleans Rums..and the one i picked was the Cajun Spice, that`s the one i was most curious about. Unfortunately i missed the distillery tour bec i was too far away stuck at Coop`s with a mountain of lovely jamblaya in front of me and there was no way to make it in time unless i had runned fast in the over 104 degree (+40C) heat with all my swag bags…(an act i wouldn`t be able to perform even for a million i can tell) But anyway, eventually i got me a bottle of the Cajun Spice. The ONO rum bottles are beautiful and on the back of the label there´s an image that is made by the founder of the Celebration Distillation, artist James Michalopoulos featuring architectural paintings of New Orleans which really does have some incredibly beautiful houses to marvel at. 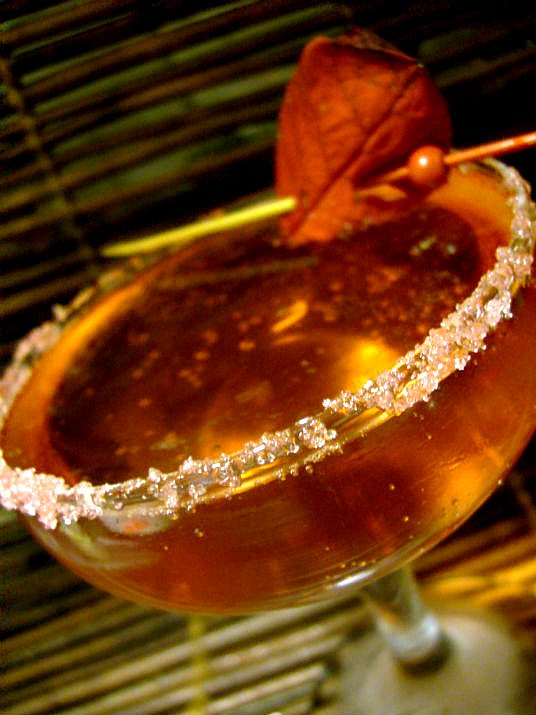 The Cajun Spice is a blend of rums with cayenne and cinnamon, hints of nutmeg, ginger, and cloves. But before i go on telling you how i find this rum i just want to say something about its history. On the backstreets of New Orleans – that`s where this rum was born – created by a band of artists and musicians who started a small production in their kitchen – and after doing lots of trial and errors and distilling for two years they ended up making a rum that today is quite famous – and made with Louisiana sugarcane. They made their own combined column and pot still which enabled them to create a more flavourful rum and they still use that still because it`s unique and produces a unique product that is all their own. In 1995 the Celebration Distillation bought an ancient cotton warehouse on Frenchmen Street. And in 1999, they made what is known as Old New Orleans Crystal which was their first white rum and after that the Amber Rum was made and from it came the Old New Orleans Cajun Spice Rum. They now also have made a 10 year old rum which is only available at the distillery. So how is this rum? the nose is very interesting, at first whiff i feel the sugarcane, caramel – somehow i get to think about french créme brulèe..then i start to detect the spices, i feel cinnamon and clove – and then i feel the vanilla.. The first sip is very much spice, and now the cayenne speaks, followed by the clove while the sugarcane sweetness is lingering in my mouth. I`m not sure if i detect a slight hint of both cinnamon and nutmeg but maybe that´s it. Its a very pleasant rum and because of the spiciness and the kinds of spices used i think its very much suited in rum-blends for tiki drinks. The spices are just right and the balance is good. This is yummy stuff! Good for sipping, good for mixing too, especially for mixing i would say. I used it already in a tiki drink and i think it proves good with demerara rum, at least to my palate and to my joy also to others. This shows how versatile this rum is and that`s a very important feature. Very unfortunately this rum is not sold outside of the States. Start squeezing the oil from a piece of orange peel and then put into an old fashioned glass. Add sugar and bitters and some of the ONO Cajun Spiced rum plus an ice ice cube and then stir until the ice starts to melt and the sugar is dissolving. Add another ice cube and the more rum and keep stirring and continue in this way until the sugar is fullty dissolved. At last spray the drink`s surface with some more orange peel oil and drop into the drink with a maraschino cherry – and a slice of orange too if you wish. Thank you Ian for teaching me your way of slowly but surely doing the Rum Old fashioned!